So maybe you’re looking around for some cool things to do to involve your guests on your wedding day. 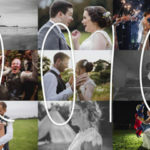 If you are using pinterest to help design and plan your big day then i’m pretty sure you will have seen ‘sparkler exits’ and ‘wedding sparkler photographs’. They are great fun for everyone involved and amazing to shoot. 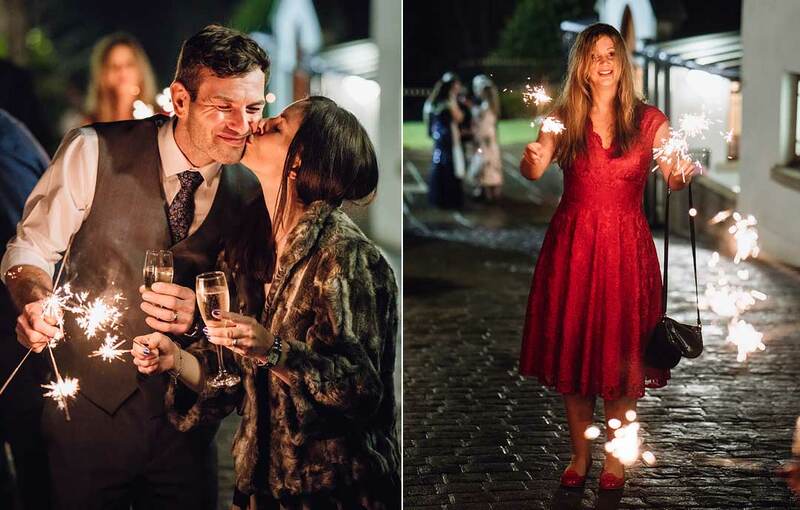 I’ve listed some suggestions below that will help you have the perfect sparkler moment. Shots can be staged like writing words or making hearts, this takes a bit of time to set up and everyone involved has to concentrate on what they are doing in order for it to work, there’s only a short time to do it and after a few beers the spelling can go a little ‘wonky’. Personally I like to see a bride and groom enjoying the moment. In the UK it’s not often that a couple will make a late night grand exit and if they do, most photographers have long gone. 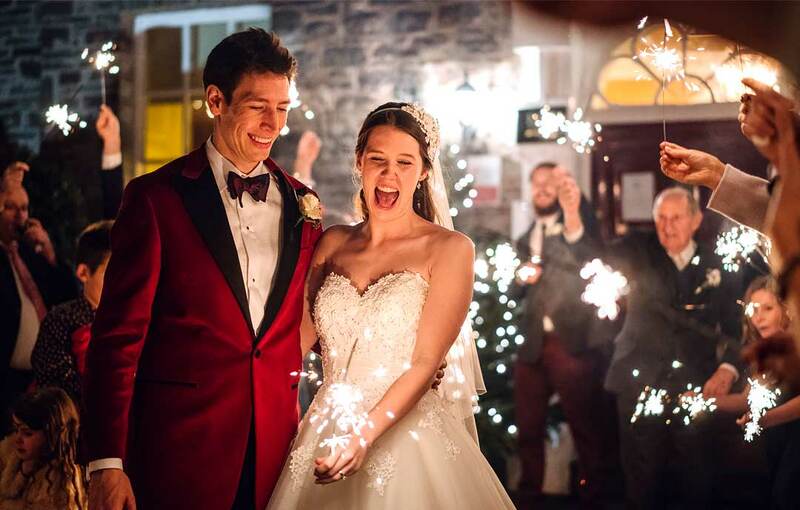 So what has become popular over the last year or so is a point in the evening where the bride and groom will have fun wedding sparkler photos with their friends and family, it’s also a nice way to get evening guests involved in your day. It doesn’t have to feel staged or complicated and the reactions can still be caught naturally. Guests randomly lighting sparklers is a natural way to catch people just enjoying themselves, that’s great, I love that, here are some natural shots caught as they happened. 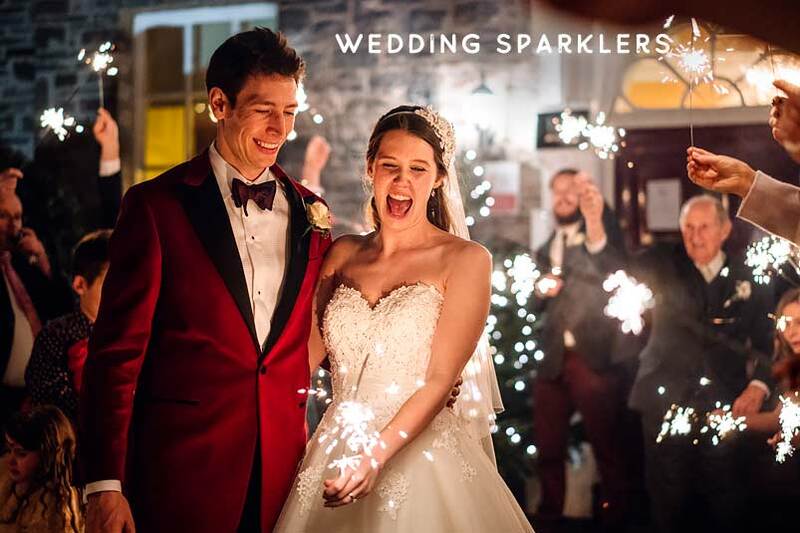 Best wedding sparklers are the ‘event’ type, up to 18 inches which are largest sparklers legally allowed in the UK. (Amazon is a great place to buy them) They don’t burn as aggressively and don’t give off as much smoke. Your average bonfire-night sparkler lasts about 30/40 seconds, the event type lasts longer maybe a minute and a half or more, so you have time for everyone to light up and take lots of pictures. 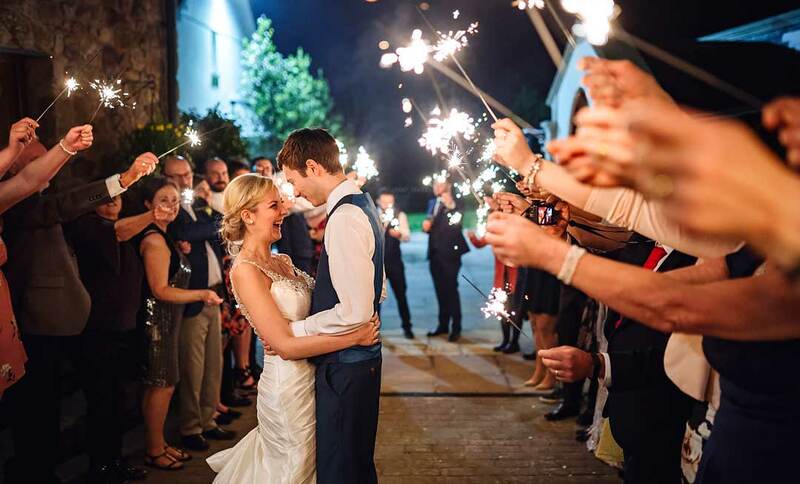 Provide (or arrange with your venue to provide) a way to dispose of the used sparklers, usually a bucket of water or sand is best. 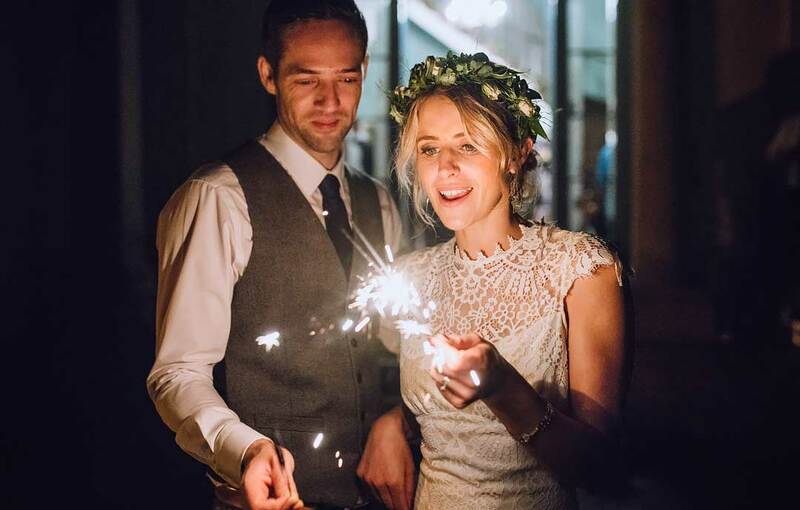 By all means display your sparklers, pinterest shows many ways to label and present them. But also it’s a good idea to display a time when they will be used, so guests know not to take them too soon. Or you can keep them out of site until the moment arrives. Ask your wedding coordinator and photographer if they will direct the whole event. This for me is the most important part. If guests help themselves and have no direction you will find someone will light their sparkler too soon, then someone else will and so on. Here’s what works for me. The band or DJ make an announcement, something like “could all guests wanting to have wedding sparkler photos with the bride and groom please make their way outside” I ask the bride and groom to hold back, continue their drink or chat with remaining guests while I set up, but be ready to come out when needed. Once the group is positioned I will hand out the sparklers and lighters making it very clear NOBODY is to light until we are ready. 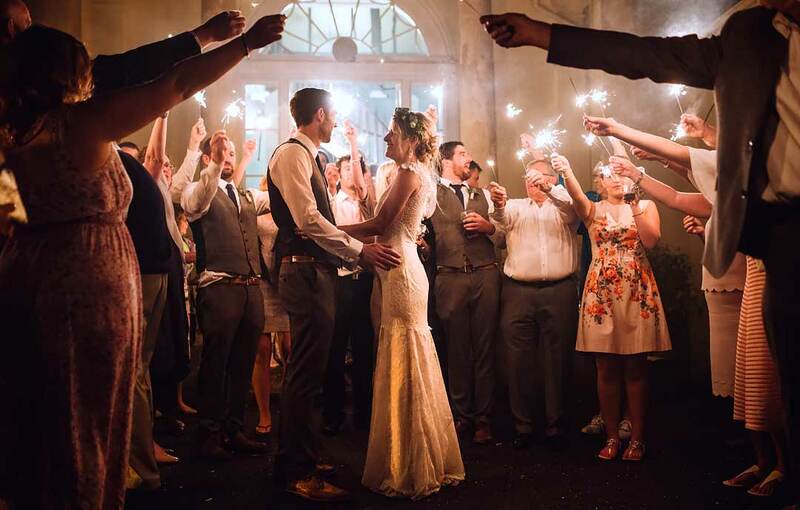 I’ll give the word to go and once most sparklers are lit I’ll call out the bride and groom, usually I ask them walk through two lines of people or into a circle. There is no posing and i’d rather them just hold hands or hug and enjoy a magical moment. Afterwards, while everyone is still in a group I remind everyone to put their used sparklers in the bucket provided. I hope my suggestions help make the perfect sparkler photo.